1. Babylonian scholar of the third century; junior to Rab (B. M. 41a). He was an expert dialectician, and prevailed in argument even against his famous senior (Yer. Sanh. vii. 25c). 2. Amora of the fourth century; contemporary of Abaye and Raba (b. Joseph). His patronymic is variously given as "Abba," "Abaye," "Abina," "Abuha," "Abun," and "Aibu" (comp. Yer. Sanh. x. 28b; Gen. R. xlii. 3; Ruth R., proem, 7; Tan., Aḥare Mot, 7; ib., ed. Buber, 9; Num. R. ii. 26). As regards his nativity, he appears in the company of Palestinian scholars (Pesiḳ. viii. 71a; Lev. R. xxviii. 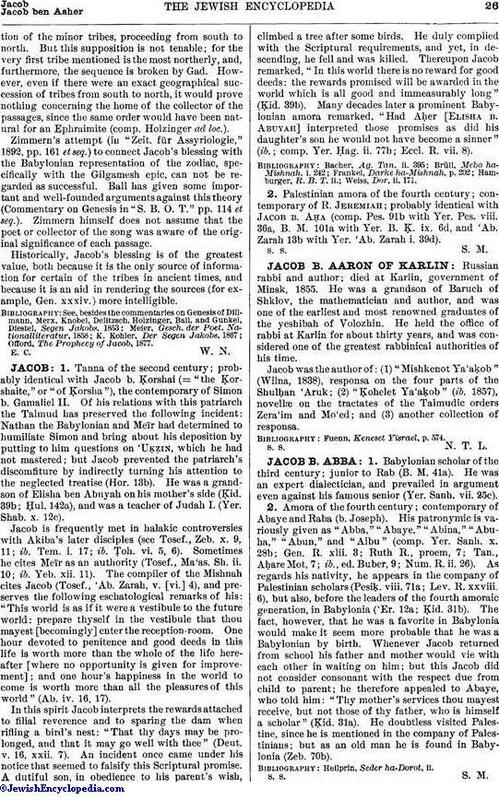 6), but also, before the leaders of the fourth amoraic generation, in Babylonia ('Er. 12a; Ḳid. 31b). The fact, however, that he was a favorite in Babylonia would make it seem more probable that he was a Babylonian by birth. Whenever Jacob returned from school his father and mother would vie with each other in waiting on him; but this Jacob did not consider consonant with the respect due from child to parent; he therefore appealed to Abaye, who told him: "Thy mother's services thou mayest receive, but not those of thy father, who is himself a scholar" (Ḳid. 31a). He doubtless visited Palestine, since he is mentioned in the company of Palestinians; but as an old man he is found in Babylonia (Zeb. 70b).